Read the Patient Information Leaflet if available from your pharmacist before you start using glatiramer and each time you get a refill. If you have any questions, ask your doctor or pharmacist. Before injecting each dose, clean the injection site with rubbing alcohol. It is important to change the injection site daily to prevent problem areas under the skin. Keep track of your injections and do not reuse the same injection site for at least 1 week. Inject the medication under the skin of the hip, thigh, abdomen, buttock, or back of the upper arm. Do not inject into a vein. After pulling out the needle, apply gentle pressure on the injection site. Do not rub the area. Discard any unused portion in the syringe after a single use. Do not save for later use. 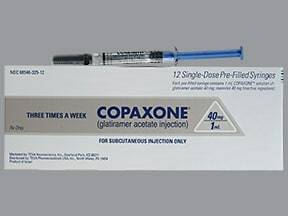 What conditions does Copaxone Syringe treat? Tell your doctor right away if you have any serious side effects, including: dizziness/fainting, infection (such as fever, persistent sore throat), mental/mood changes (such as depression), severe pain at the injection site, shakiness (tremor), swelling of the legs/feet (water retention), vision problems. List Copaxone Syringe side effects by likelihood and severity. Before using this medication, tell your doctor or pharmacist your medical history, especially of: heart disease (such as chest pain, heart attack). What should I know regarding pregnancy, nursing and administering Copaxone Syringe to children or the elderly? Does Copaxone Syringe interact with other medications? Refrigerate the syringes in their carton between 36-46 degrees F (2-8 degrees C). Do not freeze. Do not use syringes that have been frozen. If refrigeration is not possible, the drug may be stored at room temperature at 59-86 degrees F (15-30 degrees C) for up to 1 month. Do not expose medication to light or high temperatures. 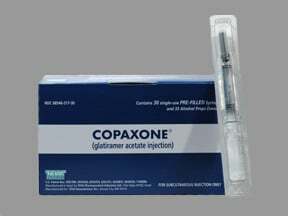 Are you taking Copaxone Syringe? Are you considering switching to Copaxone Syringe? How long have you been taking Copaxone Syringe?